First, let me say that the photo above is not our family, just there for your viewing pleasure. Back Before I was born, my grandfather, Hugh G. Jr. (aka Red), used to compete in a lot of pigeon shoots. A pigeon shoot is a shotgun contests that involves freeing pigeons a few at a time and trying to down them with minimal shots fired. These contests were staged quite a bit and a lot of people participated. He was quite a good marksman, both with a shotgun and other firearms. In one particular contest, he took first place and the award for his winning was a set of three matching Remington shotguns. 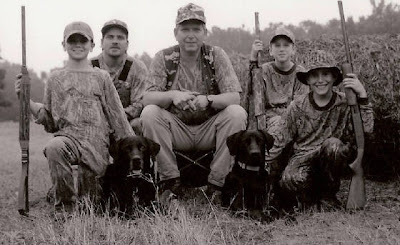 Many years later, after my grandfather had passed and the guns were handed down to my father, my father would take all of us boys hunting on a regular basis. My brother Danny was an exceptional hunter, as it would turn out. Out of all of us boys, he and my dad would compete more than any other pair for title of "best shooter" in the groups that would go hunting. One season, as we got older, my brother Danny asked my dad if he could use the longest barreled gun out of the set (my dad preferred to use this gun). It was preferable because it gave the wielder a farther range to shoot at birds. Danny proceeded to fell every winged beast which made the mistake of flying within his range. Afterward my father wrote a short story about that day and the three things he was left to ponder upon the unfolding of the day. He was not quite sure which of the three stood out as the "real" prize that day. The twenty year old, valuable shotgun as a family heirloom; the 15 dove (that's your limit for one day) that my brother shot which included two triples (three shots and three birds felled) along with a Scottish double (two birds with one shot), or the sixteen year old son who had his dad grinning from ear to ear with pride and amazement. I am sure we all know which was the actual prize. Last weekend I went dove hunting with Danny again, and I stood there on that fence line next to a pecan orchard and felt closer to God than in any church I've ever been inside. We were teasing Danny about his ability to not only shoot dove fifty to sixty yards in the air, but also so far in front of him that they dropped in front of him in the orchard. He then proceeded to not only shoot another sky high dove but took half a step forward and almost caught the bird as it plummeted toward his feet. Show off! Sure made me smile.....and miss my son and my dad. Fathers and sons, turn off your TVs and game consoles, grab your boys and girls and take them out into nature for some good old fashioned fun like our father's fathers used to have. So another weekend had rolled by and the October trip for my mom approaches quickly. My sister will be here tonight to help prep for the trip and then they will fly out on Wednesday. But this past Saturday is what I want to talk about. I got the invite to go out hunting and so we all loaded up and made the trek south of town. There is a friend with a pecan orchard nearby and six of us rugby players took our shotguns and headed out in the early morn. We all got there and parked our cars out of the way. We talked some quick strategy and then walked less than a hundred yards to where we took up positions. As the sun slowly peeked over the horizon and the wee bit of chill started to ebb, the elusive dove started flying. It was not long before the sharp pop of scatter guns started to fill the air. Six hunters ended up taking twenty birds. Not great but not bad as the dove were passing at a higher than normal height. Even then we got the occasional low flying birds to shoot at and even the high ones didn't stop us from shooting altogether. Funniest part of the day was my brother popping a dove fifty yards high and watching it fall almost into his waiting hand. Had he caught it and had it been on video it would be a youtube sensation. It was cool just to watch. I, myself, took three birds with my gun (passed down from my grandfather) and I took all the 20 birds home with me. Cooked them up nice yesterday with a half a jalapeno and an apple slice, wrapped in bacon and grilled. Cheese may have put it over the top. Next time I'll take pictures and post them and the recipe. I just wish that my son were there to enjoy the outing. This is exactly the kind of things that we are missing by being apart. Next time Miles (you too Vana if you want to go along). And this link to a video is why I want my daughter to play whatever she chooses.